Club chefs are always searching the latest culinary trends and bringing the best finds to Members. They are pretty excited about this new creation: IPA-infused pizza. Craft brewers from Chicago to the East Coast have attempted for years to blend two all-American favorites: beer and pizza. The light ales and lagers have proven the best replacement for yeast and water in dough recipes, and Club chefs find that the refreshing and moderately hoppy Space Dust IPA from Seattle’s Elysian Brewing creates a crispy, golden crust that beautifully counters the creaminess of the gooey mozzarella and classic herb tomato sauce of Traders’ Bar’s 25-centimeter, craft pizzas. 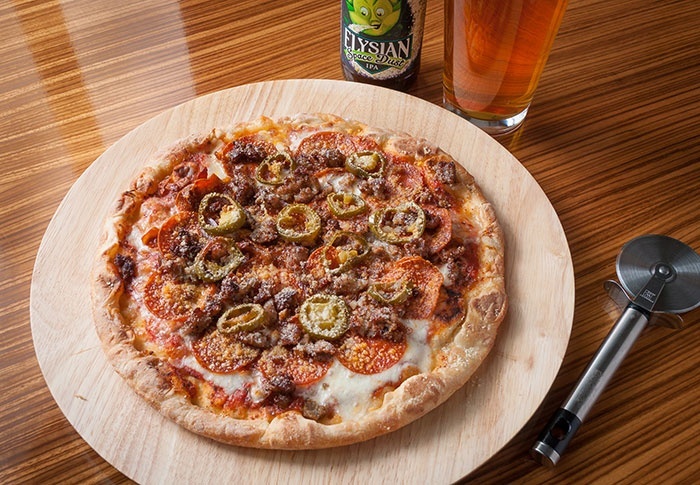 With three offerings of traditional cheese, classic pepperoni and–Kihara’s personal favorite–the spicy meat-lover to choose from, Members are certain to find their new favorite pie.